fire eating, card cheating, thought manipulation, memory demonstrations, torture stunts, and endurance challenges. It uniquely combines elements of a mind teasing magic show with a lecture about overcoming fear, intertwined with stories from an inspirational book! position once held by Harry Houdini, and performs at corporate events throughout the US, Europe & Asia. In addition, Mr. Grosso volunteered for two overseas tours entertaining our troops through Armed Forces Entertainment! Sherwood, stars of the hit improv comedy show Whose Line is it Anyway, and Banachek, a man who literally fooled scientists with his incredible feats of mentalism. The book, Exposed & Fearless, presents a behind the scenes glimpse into the lives of these remarkable people, providing the reader with first hand insight into how they captivate our imaginations. Mr. Grosso intertwines their stories with his own amazing feats of magic! Exposed & Fearless was first launched through Kickstarter on September 3rd, 2013. Within two weeks it exceeded its $9,000 funding goal and finished with over 200 backers pledging financial contributions. 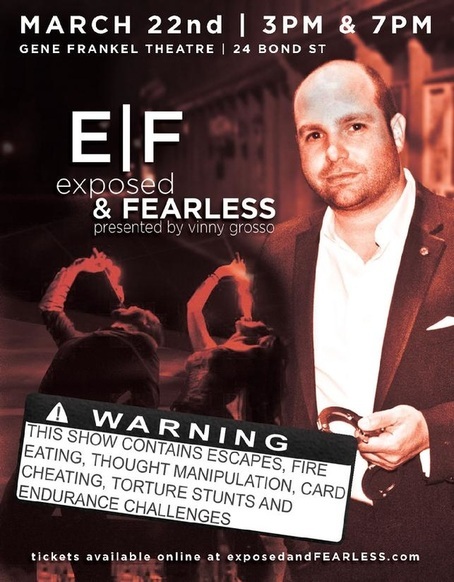 The accompanying Exposed & Fearless show, premiering in New York City on March 21st, will bring to life many of the stories in the book, infusing the emotion of a drama with the thrill and wonder of a magic show.